During its busy 2016-2017 fiscal year, ITS Communication Technologies worked on many high-profile, high-impact projects. The division finished a 3.5-year project to provide pervasive wireless on the main campus, upgraded network coverage in 45 buildings and boosted Wi-Fi in the residence halls. 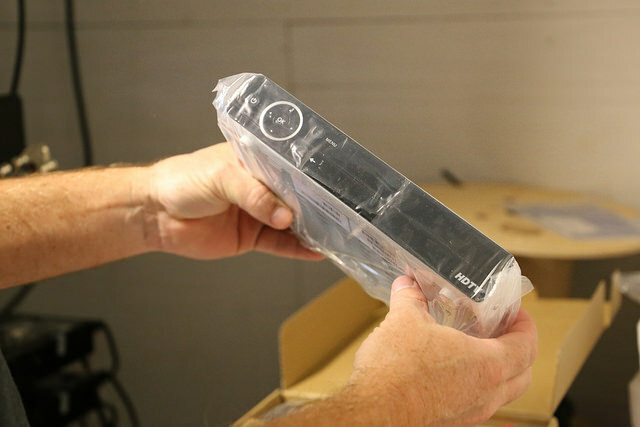 Communication Technologies also continued to build upon critical collaborations with agencies across Orange County to jointly improve high-speed connections and began installing fiber on campus that will enable the Athletics department to provide live video and data for the ACC Digital Network that ESPN and the Atlantic Coast Conference are launching in 2019. Please keep reading for all of Communication Technologies’ highlights and key statistics from the 2016-2017 fiscal year. ITS finished adding Wi-Fi coverage in the Kenan Stadium Concourse during the 2017 summer break. 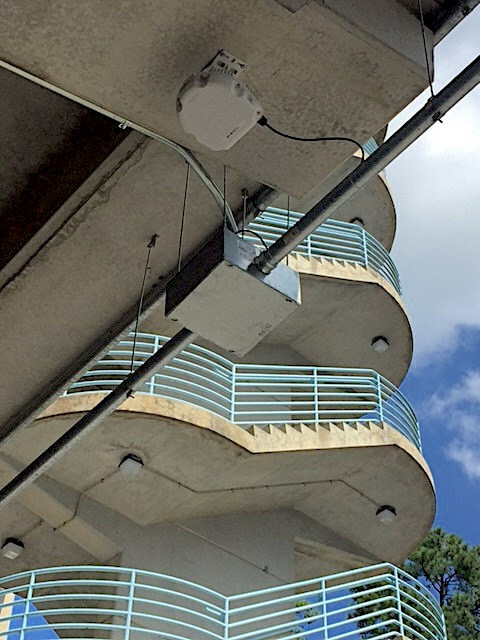 ITS Communication Technologies has wrapped up a 3.5-year project to provide pervasive wireless coverage within all remaining campus buildings. When ITS launched the project in 2014, less than 35 percent of campus within-building space had appropriate Wi-Fi coverage. In this significant effort, ITS deployed new cabling throughout most buildings and more than 4,000 new access points. ITS first upgraded general-purpose classrooms to ensure good Wi-Fi coverage. Three years later the equipment was not obsolete. However, ITS wants to keep the best-performing and latest technology in the large lecture halls that seat 200-plus students. In those classrooms, most students bring with them at least two Wi-Fi-hungry devices, meaning some 400 devices can be simultaneously demanding wireless access. 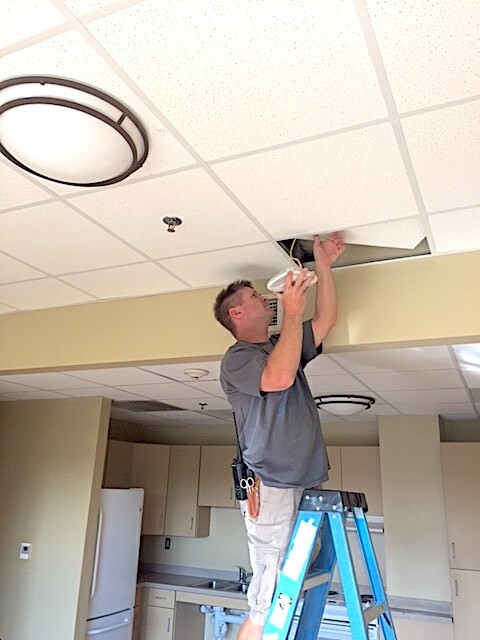 For that reason, Communication Technologies again began installing new technology and access points in the largest classrooms during the 2017 summer break. Before the start of the Fall 2017 semester, ITS had upgraded 64 access points and finished the uplift for large classrooms. During the 2016-2017 fiscal year, ITS Communication Technologies was able to completely upgrade network coverage in 45 buildings without sacrificing day-to-day network operations and support, bringing the campus network coverage up to more than 300 buildings. This was possible because of a clearly defined lifecycle refresh budget. Several years ago ITS defined a schedule for providing network lifecycle equipment refreshes by instituting the Communication Technologies Funding Model. Under this schedule, the lifespan for within-building “access layer” network hardware was projected at seven to 10 years; ideally, closer to seven than to 10, but with the expectation that it might have to be 10 years. However, network hardware vendors are increasingly ending support for their devices within seven years or less as technology continues to advance. Communication Technologies had a goal of upgrading as many buildings as possible during the 2016-2017 fiscal year. With the rate of refresh that Communication Technologies achieved — those 45 buildings — the division is on target to reach that seven-year lifespan on an ongoing basis. As part of life cycling efforts, Communications Technologies has been actively “right-sizing” the network by reducing the total equipment count (points for failure) to account for the ongoing transition from wired ports to wireless. The division also been removing, at a rapid pace, all the really old generation switches that only support 10/100 Mbit to the edge. Communications Technologies reduced those switches to around 250 by the end of the 2016-2017 fiscal year from around 1,000 a year earlier. The division expects to have the rest of the switches removed and replaced by the end of the 2017 calendar year. The town of Carrboro was a crucial collaborator in assisting ITS with directly connecting the UNC Horizons Program’s new Carrboro facility to main campus IT services. Over the past year, UNC-Chapel Hill has continued to build upon critical collaborations with agencies across Orange County to jointly improve high-speed connections as demand and prices for bandwidth skyrocket. Jim Gogan, Assistant Vice Chancellor of ITS Communication Technologies and ITS Engineering Manager Craig Baker have been instrumental in efforts to unite Orange County public agencies to collectively enhance network connectivity. The need and urgency are greater than ever for these collaborations transpiring through the Orange Public & Education Network, a 1.5-year-old group that is made up of UNC-Chapel Hill, Chapel Hill-Carrboro City Schools, Chapel Hill, Carrboro, Hillsborough, Orange County, Orange Water and Sewer Authority, UNC Health Care and Orange County Schools. Each agency is working on fiber projects, is planning projects or needs to expand bandwidth but first has to find a way to pay for it. Many schools within Orange County rely heavily on the big, private companies to provide internet service. One high school that is paying month-to-month after its contract expired is forking out 300 percent more than it did a year ago, Baker said. Some three-fourths of school campuses within the county, he said, are seeking interconnections with local government fiber because they can’t afford private providers’ skyrocketing prices and, in some cases, also because service is not available in remote areas. By building these trust relationships, generating goodwill and opening the floodgates of creative ideas, UNC-Chapel Hill and these other agencies have found that they’re able to achieve things together that they wouldn’t have been able to singularly. They’re solving connectivity problems by exchanging bandwidth resources. Over the last three years, collaborations with Chapel Hill and Carrboro enabled ITS to get to remote sites without ITS spending a lot of money or having to go to commercial services. 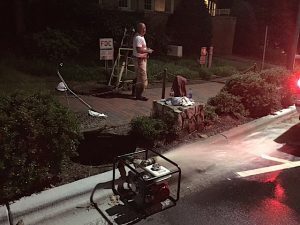 Through an arrangement with the town of Carrboro, ITS dropped its fiber lease with AT&T for Carr Mill Mall in early 2016 after connecting to the mall via a blend of ITS’ and Carrboro’s fiber networks. The project will pay for itself in two to three years, as is often the case with such projects. By cancelling monthly paid service from a private provider and moving the stream of funds to capital expenditures, agencies invest in working with one another to extend and interconnect their fiber networks. ITS started fiber installation work on the early morning of June 6, 2017. In June 2017, ITS began installing a couple miles of fiber on campus that will enable the Athletics department to provide live video and data for the ACC Digital Network that ESPN and the Atlantic Coast Conference are launching in 2019. “No one will be on this fiber but Athletics,” said Chad Ray, Manager of Transport Operations, a group within ITS Communication Technologies. This is the first project in which ITS has installed an entire fiber backbone for use solely by one campus entity. When ITS lays additional fiber, its customer is usually the University for fiber that the entire campus will use. For this sports network project, Athletics is ITS’ customer. Athletics is buying the fiber. ITS is installing it and will maintain the fiber for Athletics. For more than a decade, Athletics has leased fiber from ITS for video production. Athletics needs 48 strands of single-mode, long-haul fiber between the Dean Smith Center and Carmichael Arena and spur cables to the athletic venues. Athletics will transmit more than 200 athletic events per year from the sports venues to the production studios and main hubs at the Smith Center and Carmichael and then on to the ACC DN linear channel that the ACC and ESPN are launching. Currently, there are only two pairs of fiber to each arena. Considering Athletics would have to share that fiber capacity with all of the University’s networking needs and for the Distributed Antenna System, those two pairs are not sufficient. In addition, video needs to have a lot fewer splices and bends in the fiber than data requires. Remember, light is shooting through these fiber-optic lines. Like a flashlight, the farther away it is, the dimmer it gets. Attenuation, the amount of signal or power lost from one end to another, depends on the equipment. To work properly, video needs to have lower attenuation. To limit the amount of attenuation for this project, Transport Operations has to pull longer runs of fiber, Ray said. The first phase of this project for Athletics, Transport Operations consists of installing fiber to link the Smith Center, Carmichael, the football and baseball stadiums, and planned indoor and outdoor facilities for football, soccer and lacrosse. Additional fiber could be installed in a possible second phase at the University’s outlying athletic venues for golf, tennis and softball. For the project, some 40,000 AT&T phone numbers needed to be ported out and roughly 20,000 actual devices needed to be replaced. ITS Communication Technologies ported out 9,000 numbers in early 2017 to Verizon Business, and is gearing up to close out the year with an additional 6,000 numbers in December. This brings the total for numbers ported out this year alone from the legacy AT&T phone system to an estimated 17,000. By year end, ITS will have ported more than 35,000 phone numbers from AT&T to the current Voice-over-IP phone system, a hosted system provided by Verizon Business. Although there’s still this clean-up work, Communication Technologies’ officially finished its roughly five-year VoIP project to migrate the University’s phone system over to VoIP in fiscal 2016-2017. “Porting will remain a significant activity within Comm Tech for many years to come, in particular as we evaluate and execute options for the next evolution of voice services,” said Cheri Beasley, Manager of Voice Services and Remote Connectivity. 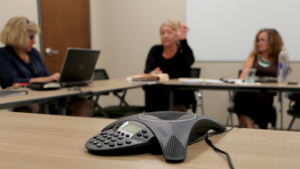 During the five years of the VoIP project, ITS replaced phones on desks and ported out the bulk of the working phone numbers to the new service provider, thereby positioning UNC-Chapel Hill for changes in telecommunications technologies and services. For the project, some 40,000 AT&T phone numbers needed to be ported out and roughly 20,000 actual devices needed to be replaced. ITS focused in the 2016-2017 fiscal year on introducing the capability for delivering new services from Voice Services as well as closing the gap on any remaining phone numbers to be ported out. Going into the fiscal year, ITS had about 18,000 remaining AT&T phone numbers to transfer. The numbers consisted mostly of spare or non-working numbers and UNC Health Care numbers. During the first half of 2017, ITS ported 9,000 phone numbers and cleaned up and removed some legacy phone systems that had been left in place to work behind the new VoIP phones lines. RAM Village buildings 1-5 were among the locations that received additional wireless access points. As Carolina students opt to use their smartphones for an increasing amount of their online needs, the Wi-Fi access points in the hallways of the University’s residence halls haven’t been able to keep up. The wireless system that ITS finished installing in the dorms three years ago was designed for the laptops of that time, which had a pretty robust ability to transmit and receive Wi-Fi power. Since then, as a way to increase battery life, manufacturers reduced the transmitting and receiving power of their devices. Meanwhile, the number of wireless-dependent devices each student brings to campus has proliferated, escalating demand on the system. As a result, those hallway signals couldn’t always reach all the way back into the corners of the bedrooms. To satisfy students’ wireless needs, ITS Communication Technologies installed a denser Wi-Fi system in the residence halls, in coordination with ITS ResNET and the Department of Housing & Residential Education. Each room or suite received a connection. ITS started with the locations that had the most feedback about trouble spots. Work on Baity Hill apartments, which were the first priority, ran from February to April 2017. ITS installed 400 additional wireless access points in Baity Hill. Installation in the second priority locations started on May 30, 2017. Priority two locations were Craige North, Hardin, Horton, Koury and Ram Village buildings 1-5. ITS installed 535 additional wireless access points in these buildings and completed this project before the start of Fall semester. 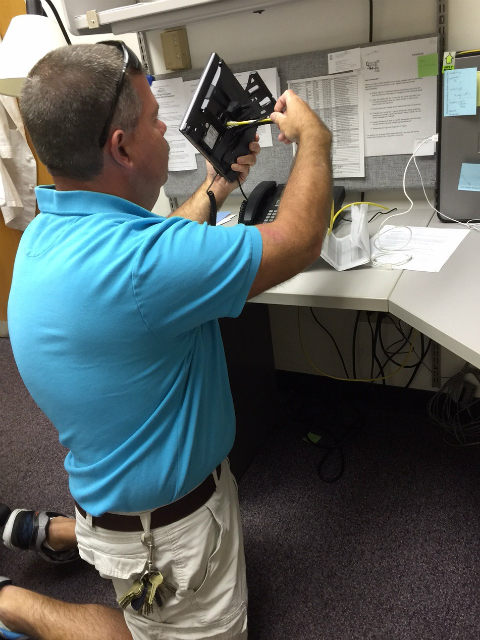 ITS staffers install a new Cisco Nexus at ITS Franklin. 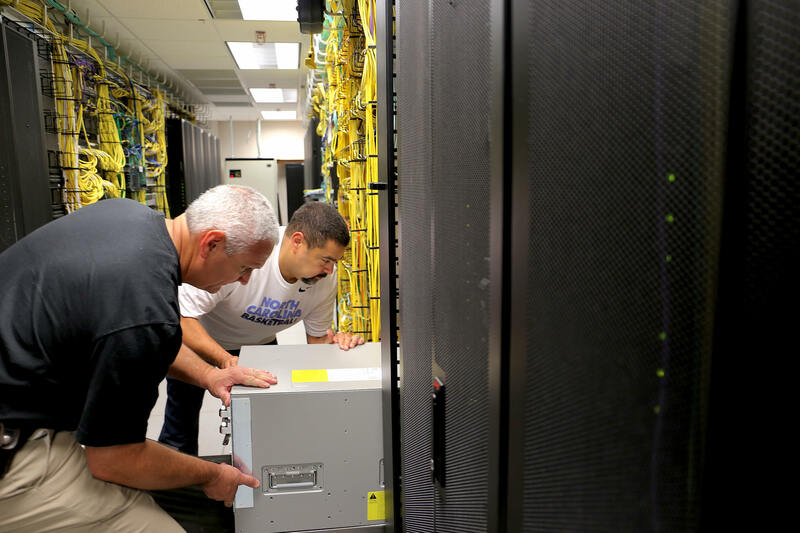 ITS Communication Technologies has begun upgrading the University’s networking core to provide better redundancy, more flexibility and much higher bandwidth. ITS selected Cisco System as the vendor for the upgraded core routers in May, and started the upgrade in July. The work will be broken into phases over eight months, said Danny Shue, Network Architect with Network Operations, a group within Communication Technologies. The purpose of the core is to provide reliable and fast transport for traffic between different parts of campus, such as between classrooms, departments and the data center. Since 2006, the current network core has provided bandwidth of 20 Gbps (billions of bits per second). Campus demand, however, has escalated with the upsurge in use of mobile devices, video and big-data applications. The new core will support 160 Gbps bandwidth for future campus network usage growth. To understand the difference that additional bandwidth can make, one only needs to compare download speeds of a video. Downloading a 5 GB movie over a 20 Gbps link takes 2,000 milliseconds. With the bandwidth capacity of 160 Gbps, the time shrinks to 250 milliseconds. The network core also needs more flexibility. Currently, it’s difficult to gain visibility for traffic through campus border Intrusion Prevention System (IPS) security devices. If needed, ITS also will be able to carve out portions of the main core for a new school or department, for example. This ability to virtualize the network can also save University money. “It creates that flexibility for us to architect our network,” Shue said. In addition, ITS will be able to create redundancies in the networking core. For redundancy, each core router will consist of a pair of chassis. They are physically located in two different data centers for geographical redundancy. “Now everything is double and separated in two different locations,” which provides a backup if something happens to one of the data centers, he said. ITS is pursuing a new tool to replace the in-house applications that run the University’s Domain Name System (DNS) and IP address management. DNS is a critical service that has a huge impact on the campus community’s day-to-day life. As with some other services on campus, when the existing DNS service works well, the campus community don’t know it exists or at least they don’t think about it. For example, when you type a URL like ‘www.unc.edu’ in a browser, DNS tells the application which server to go to. A URL is easy to remember for humans, but the real address is a complex string of numbers called an IP address that computers and network equipment use to direct network traffic to the correct destination. Since the service began, ITS has used in-house applications to run its DNS and IP address management system. Demby and Will Whitaker, DDI Architect with Network Operations, are the service owners. In March 2017, they were tasked with finding a replacement tool. “We want to have a solution in place by the end of the year,” Whitaker said. The existing tool is primarily manual and has few checks and balances. Also, the campus wide DNS is fragmented, with departmental groups using different tools or manual approaches. By purchasing a vendor-provided solution for DNS, DHCP (Dynamic Host Configuration Protocol) and IP address management, ITS plans to modernize the University’s system. Because an application programming interface (API) is available, ITS will have the opportunity to build new capability, such as for business processes, security and virtualization. With a new system, ITS also can create configuration efficiencies and reduce human error. In addition, this service would provide other campus groups with an easier way to manage DNS, Whitaker said. DNS will also begin serving an increasing role in providing protection from online threats from malicious sites and sources of malware. “We definitely want to improve on what we’ve got and what we can offer others,” he said. The campus switched to an all-digital TV system in December 2016. Because Direct TV phased out its standard-definition service, ITS Communication Technologies and ResNET switched campus cable TV over to the new all-digital system on December 21, 2016. Formerly a unit within ITS User Support & Engagement, the University Operators group became part of ITS Communication Technologies in October 2016. The University Operators group answer calls to the main number of UNC-Chapel Hill 919-962-2211, providing directory assistance and general campus information to the public and the University community.